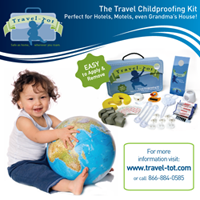 Travel-Tot: Feeding Little Travelers On-The-Go! Feeding your little traveller on the go can be challenging at times! Depending on your child's age, there are a myriad of considerations to take into account for your young traveller, from allergies to maintaining your regular feeding schedule. Below are a few quick tips for keeping your little explorer satisfied and safe! Your child is never too young to suffer an allergic reaction, so before you embark on any trip you should be aware of any possible food allergies your child may have and pack any possible medication he or she may require if an allergen is encountered. Stow the appropriate medicines, prescriptions and portable epinephrine injector (“epi pens”) in your carry-on luggage, where you can access them easily in case of an emergency. If you are travelling by air, it’s a good idea to carry a note from your doctor authorizing the possession of an epi pen. For train or air travel, pack a few extra bottles of formula in case of delays. Be sure to familiarize yourself with the TSA's limitations on carry-on liquids. If your infant has started on jar foods or cereals, be sure to pack items he or she has already tried and has not had an adverse reaction to - vacation is no time to discover a new allergy. Never attempt to bottlefeed or breastfeed an infant in a moving vehicle. Infants should always be strapped into an age-, weight-, and size-appropriate carseat when a vehicle is in operation. When bottle feeding, hold the bottle at all times and control the angle to moderate the flow to suit your baby. If baby is with you at the table, be sure to keep sharp or pointy items, hot liquids or dishes, and pills and other small items out of the his or her reach. Also, avoid drinking hot drinks when breastfeeding. Young children should always be closely supervised during feedings, and that can present some difficulty depending on your mode of transportation. Consider packing a portable feeding seat to stabilize and immobilize him or her during mealtimes. To reduce the risk of choking, keep hard round foods, such as nuts and hard candy, out of very young children’s reach. Cut your toddler’s food into very small bites. Always make sure children eat while sitting down. Keep all pills and medications separate from food items to avoid accidental ingestion by children. Also, watch carefully for loose magnets. If more than one is swallowed, they can attract each other in the body and cause serious injury or even death. Call Poison Control at 1-800-222-1222 if you suspect that medication or poison may have been accidentally ingested by your child. This number will connect you to emergency help in your area. Keep the number in your cell phone. Packing familiar items such as sippy cups, small spoons, straws, and bottles will help your child eat the way they have become accustomed to and can help prevent little mouths from overstuffing. Also, following your child's normal feeding schedule will help keep you child from experiencing the discomfort of extreme hunger which can lead to crankiness and tantrums. A little knowledge and planning go a long way toward making on-the-go feeding safe, comfortable, and hassle-free; so spend a few extra minutes on packing and planning, because enjoying the journey is as important as enjoying the destination!